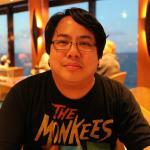 MPAA Rating: PG-13 for some thematic elements, language and sexuality. Running time: 103 minutes. Released by Lionsgate. 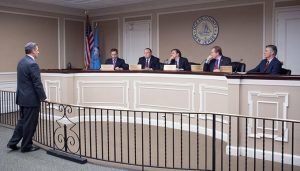 The story of Ocean County detective Laurel Hester is easily found on the internet and in newspaper clippings. A 23-year-veteran of the local police force, Laurel was diagnosed with rapidly spreading end-stage cancer, living her remaining time with her partner of five years, Stacie Andree, to whom Laurel willed her pension and the house they shared. 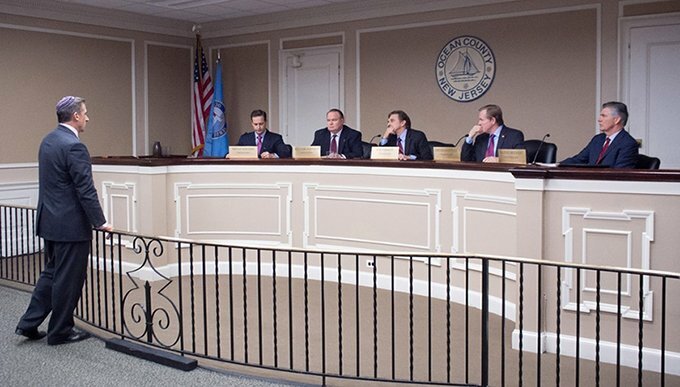 However, due to the Freeholders of Ocean County (a legislative committee of five men, portrayed here as morally forthright and sexist), even though a domestic partnership law was in place, she was denied the right to give her pension to Stacie. 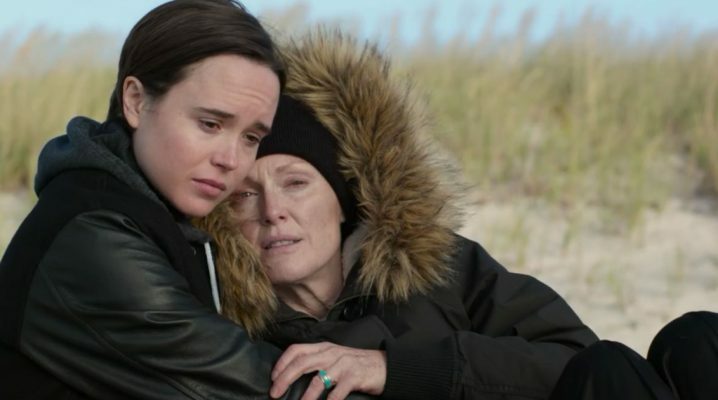 So began a two-year battle for equality, which director Peter Sollett’s film Freeheld dramatizes in spectacular fashion, bringing out the superb acting talents of Julianne Moore (as Laurel) and Ellen Page (as Stacie). When these two are together – which is pretty much the whole film – their performances are equal parts muted, matter-of-fact, and electrifying. Moore’s transition from a hot-action-cop with control issues to a dying woman who can barely breathe will, no doubt, garner awards nominations and wins, and deservedly so. It’s not just her outer aesthetics changing – it’s her everything that changes. 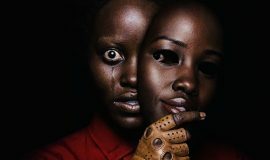 Her soul, the fire in her eyes, the spirit in which she fights knife-wielding perpetrators, her illness, and injustice alike – Moore sears herself into our brains with one of her most memorable performances, and she should be well-recognized for it. Likewise with Ellen Page, seen here as the woman battling for the love of her life. Page’s inimitable style of awkward inelegance serves her well as she skulks through her scenes, hunched over and wary, as if constantly waiting for the other shoe to drop. Yet there’s a fierceness she gives to Stacie that doesn’t come around often; instead, she uses it for scenes where she demonstrates her love for Laurel and how far she’s willing to go to protect her. 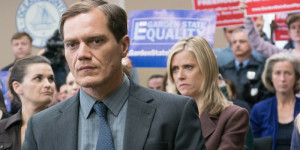 Also, Michael Shannon deserves credit for being the a large part of the heart and soul of this film, portraying Laurel’s detective partner Dane Wells. So far, so good, right? We’re in the middle of this review and there’s nothing that seems to be wrong with the story or script so far; the film, to this point, has been given appropriate amounts of joy, melancholy, sadness, and anger. 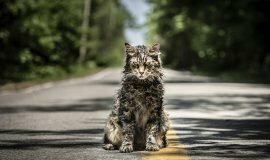 The film’s themes of struggling for what’s right and the impending loss of a loved one are totally entrenched, we’re taking Moore, Page, and Shannon seriously… and then Steve Carell comes in like the Tasmanian Devil in the old Warner Brothers animated cartoons and fucks everything up. Please understand that I don’t use that profanity lightly. “Messing everything up” doesn’t even begin to cover half of what I felt he did. He may be portraying out-and-proud equality activist Steven Goldstein, but we’ve seen Carell like this at his most outrageous, which turned the middle of the movie into near-comedy. It’s as if Sollett said, “Things are getting way too heavy here. Time for some shenanigans.” Does Freeheld need this much of a break from the seriousness of its situation? If we look at Philadelphia, another film about a dying person seeking justice from his employers which was written by the same writer, Ron Nyswaner, we don’t. Goldstein’s involvement brings a bit of a farcical theater to Laurel’s fight, making her voice jump from a direly impassioned plea to one advancing a cause she doesn’t even want to be involved with. 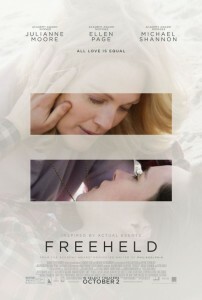 That’s another thing that bothered me about Freeheld. While watching it, I felt like we’d seen it all before, only it starred Tom Hanks and Denzel Washington. Moore’s final scene in this movie even echoes Hanks’ last scene in Philadelphia, at which point I found myself wondering if the same person wrote both films. As it turns out, Nyswaner did. Yes, I understand that these are similar circumstances which *do* bear repeating. The fight for equality still rages on, and both Philadelphia and Freeheld are terrific examples of cinematic markers depicting pivotal moments in gay rights history. 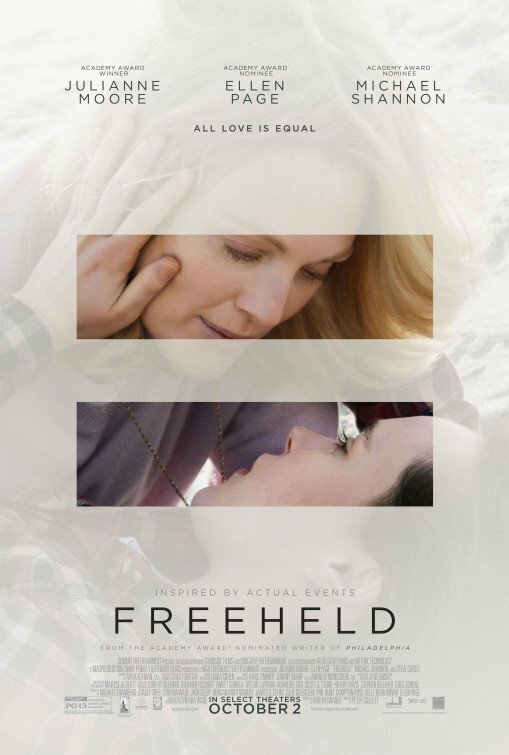 However, Freeheld doesn’t quite match the passionate depth of Philadelphia, nor does it take us to the heights for which they are so obviously reaching. When even the score by Hans Zimmer and Johnny Marr feels recycled from another collaboration of theirs (2010’s Inception), I have to give pause and wonder what about the movie is worth watching. The answer is courage. Laurel Hester is portrayed through a stunning performance as someone who picks her battles and doesn’t walk away from what’s right, and the supporting cast – no matter how out-of-left-field they may be – does their worthy best to make sure we feel the struggle within, Nyswaner’s dry script notwithstanding. The closing credits contains a wonderful song written by Linda Perry and sung by Miley Cyrus; stay and listen.